Some years ago, our oldest daughter, Leah, spent a summer in France as part of a college exchange program and she commented to us that, “everyone over the age of ten smokes!” Well, that’s Las Vegas! When you’re used to no smoke anywhere, it’s somewhat of a shocker to find you’re inhaling second-hand smoke pretty much everywhere, especially the casinos. But, as neither of us gamble, that’s not much of a problem. We made our annual pilgrimage to Las Vegas so John could attend the National Association of Broadcasters Convention and I could attend the outlet stores. We both walked miles and miles, he looking at equipment and networking and me shopping for future birthdays. A good time was had by all. 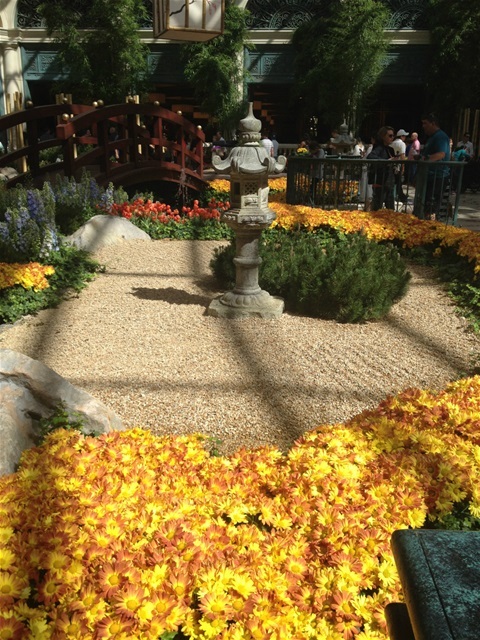 The best thing we always do there is spend an hour or so at the Bellagio Hotel wandering through their Conservatory & Botanical Gardens. Oh, dear friends, the beauty that one can behold meandering through fields of tulips, gazing down at ponds and streams surrounded by chrysanthemums, daffodils, hyacinth, lilies, and the colors! Purple, red, yellow, orange, white...every shade you can imagine. It's like the Rose Parade standing still. The theme while we were there was “Spring Celebration,” bringing to mind cherry blossom time in Japan. Umbrellas suspended from the high glass ceiling, enormous faux cherry trees with acrylic blossoms surrounded by raked gravel gardens and water cascading from bamboo pipes. Tea houses, cranes in flight, an enormous turtle whose back is composed of fresh flowers changed by hand every three days. We find that such beauty reduces us to silence. We so admire the creativity and genius that goes into these Atrium shows. Think of it: How many pots of tulips to order, as they are all in pots and changed out when they are through blooming, how many workers in this place to keep it pristine and beautiful, how to construct a gigantic crane and give it feathers. God created all of this. The flowers, the ideas, everything that goes into the formation of beauty. We rejoice that we have eyes to see. It’s very hard to do much more than thank God for the beauty that surrounds us, as we walk through banks of orange and yellow tulips. To thank Him that He thought lilies were necessary. Getting home from Las Vegas, I realized I wanted comfort food and this is definitely it, one of those recipes that you can make five million times and nobody ever gets tired of it. It’s quick, relatively inexpensive, kids love it, you can serve it with tomato soup and everyone who sits down with a couple of these will go, “Ahhhhhhhhhh…..” guaranteed! Mix together, chill three hours, if you’ve got three hours. But we always wanted it NOW and it works just fine on that basis. Spread on sourdough bread and put under the broiler till it’s melted and slightly browned. You can use any kind of sharpish cheese, I think adding some Pepper Jack would be fantastic. Don’t think too much about calories, just enjoy it. Remember, life is short and dessert should be eaten first. A beautiful vase of flowers on the table wouldn't hurt either.